With all the love and care she provides, your mother is probably the hardest to shop for when it comes time to return the favor. This year, gift her something she can treasure for years to come with beautiful and unique Mother’s Day presents from Whimsical Gifts. 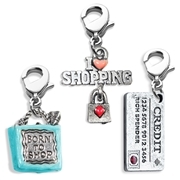 With our handcrafted selection of Mother’s Day charms, accessories and other personalized jewelry for moms, there runs no risk of having your gift end up in the forgotten corner of her closet. The best Mother’s Day jewelry gifts are keepsakes that will last. All of our pieces are directly made in the USA, so you can rest assured that you’re receiving top quality. Every single piece is available in silver and gold-plated options, and all of our charms are hand painted with precision. Beyond mothers, the accessories you see here also make gorgeous gifts for any shoe lover or shopaholic in your life. Do you have a question about a particular product? Call us at 877-324-0845, and we’ll help you narrow down that perfect gift for a friend, relative, coworker or significant other!